Every person who walks through our doors matters. to be fed physically, emotionally and spiritually. This teaching is central to the values of the community of faith called Centenary Church. Miraculous connections take place when we set aside social, economic, racial and even religious differences and gather together to share our own unique experiences of life, faith and encounter with the Divine Mystery that is God. We invite you to join us on the journey as we seek together to rediscover the mysteries of faith. We sincerely believe that ours is one of the warmest, most accepting communities you will ever discover. Each of us is a testament to this belief. We are all broken, yet beloved children of God and have found hope, grace, and love at Centenary. We hope you will join us and see for yourself what Centenary is all about. Worship at Centenary is varied because we understand that there is no single style that exclusively connects us to God. Music may include traditional hymns or more modern praise choruses. You will find that we use our organ and piano as well as guitars, keyboards, and sometimes trumpets and flutes to lead our congregation in worship. Preaching responsibility is shared among four different staff members. Each of their voices provides us with a unique and varied view of God and challenges us to understand God from other perspectives. The one constant in our Sunday worship service is that our worship is genuine and passionate, whatever form it takes. Centenary Church is located in downtown Macon on Tatnall Square Park and across the street from Mercer University. From I-75 South, take exit 164 (Hardeman Ave/Forsyth St/Downtown). Go straight through the first traffic light. Turn left at the second light onto Forsyth St. Turn right onto College St. (following the Mercer University sign). Centenary will be on your left at the corner of College and Ash streets. From I-75 North, take exit 164 (Hardeman Ave/Forsyth St/Downtown). Take the "Downtown" ramp. Turn right onto Forsyth St. Turn right onto College St. (following the Mercer University sign). Centenary will be on your left at the corner of College and Ash streets. In addition to on-street parking along College, Coleman, and Ash Streets, we have a parking lot as well. If you follow alongside the main church building down Ash Street, you will find the entrance to our parking lot on your left, just past the Community Center building. 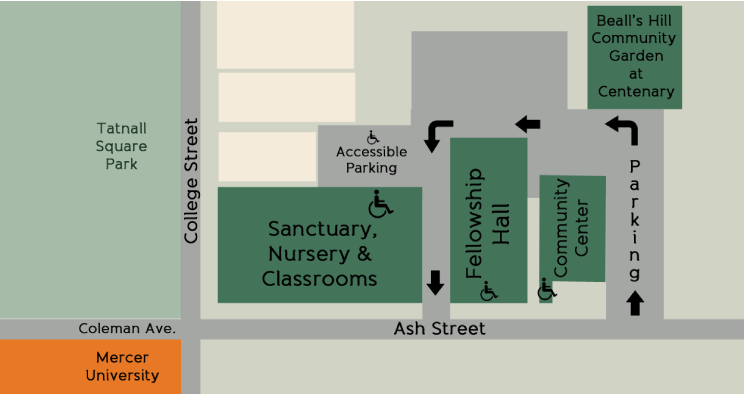 For Handicapped Parking and Building Access, follow Ash Street along the side of the main church building and turn left into the first driveway (between the main church building and the church office building). You will find the handicapped parking spaces on your left. Upon entering the building from the door on this handicapped parking lot, you will find an elevator inside the first doorway to your left. The Sanctuary is located on the second floor.